Pac Man is one of the stalwarts of the video game industry and has been chomping his way through pellets and fruit since the 1980s. In modern gaming terms, he's featured in several games such as Pac-Man & Galaga Dimensions on the 3DS, Pac-Man World on the GBA, Pac-Man World Rally on the GameCube and he was even playable on Mario Kart Arcade GP. 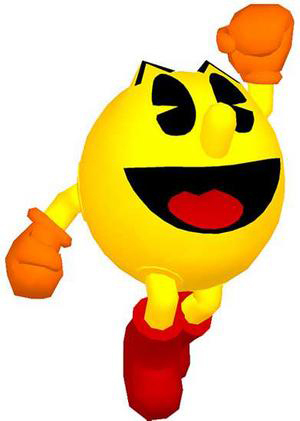 Namco Bandai has now announced there's to be another game starring the little yellow legend called Pac-Man and the Ghostly Adventures heading to Wii U, Xbox 360 and PlayStation 3. There's also set to be a side-scrolling version of the game for the 3DS. Pac-Man and the Ghostly Adventures is set to compliment an upcoming animated TV show that will begin airing on Disney XD this Summer and it has you play through the vibrant universe of Pac-World, which has been taken over by those pesky Netherworld ghosts, led by their evil leader Betrayus. Naturally, you take control of the last surviving yellow Pacworlder, and reclaim Pac-World once more. 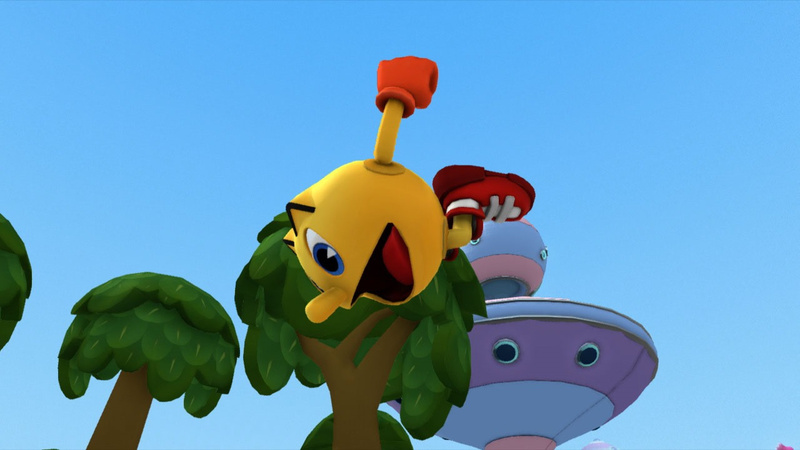 Pac-Man and the Ghostly Adventures will feature some throwbacks to the classic style of gameplay, with elements such as "Ghost encounters" making a return. Of course, you'll also have the ability to chomp away on the baddies but this time round you'll have powered up variations making it all the more satisfying. The game is set to be released this Fall in North and Latin America and in Winter for Europe and Oceania. What are your thoughts on this new Pac-Man game? Check out the trailer below and let us know what you think to it. Not too sure on this. Hope it turns out good. I hope it is like the Pac Man World series. Based on the trailer the game looks good but the chomping mechanic seems imprecise (a mechanic that lock onto the ghosts would be better in my opinion). Since it is based on a TV show I will definitely have to wait for reviews before I consider getting it. Looks pretty good from the trailer though. I actually think it looks genuinely good. I hope that gameplay has some depth to it though. Since it is based on a tv show I am not certain how good it will be since those types of games are sometimes hit or miss with me. @Dpishere Reviews are nothing more than someone's opinion on the game. You need to play demos instead to make your own opinion on the game. If for some odd reason, there's no demo than go ahead and read reviews. The only thing I like about reviews is that the reviewer will inform you if there's something wrong with the game. For example long loading etc. Actually, this looks like it has potential. there are a few minor changes I would like to see, but overall, this game could be quite a solid platformer. Poor Pacman. For being such a video game icon, he sure is in a lot of bad games. Needs less generic "chomp noise" and more "WAKAWAKAWAKAWAKA"
Seriously, half the charm of the series is the original sound effects. Also, where's Ms. Pac-Man's ribbon? Or is that female character we saw someone new? (Sigh).... It's been a while since we've come back to the Pac-man World mechanic. I missed that so much. So that new art style was used for this...it looks pretty ok. It's a 3D platformer, so that's already a big plus for me. Im not too sure about this one, we will have to wait for the reviews. I'll at least pick up the 3DS version. That munching sound will get annoying. @WiiURockz Yeah I have learned that lesson a long time ago. My most recent example is Dillon's Rolling Western : The Last Ranger, the game may have been given a review score of a 6, but after seeing so many videos of it and having liked the way the game looked from both the first and second game I decided to give it a try. I ended up loving the game and it is one of my favorite games on the 3ds. All in all I don't take review scores themselves very seriously since only I will know how much I will enjoy a game, though for me I usually can only count on Nintendo games being high enough quality to where I don't need a review. Other companies, I tend to look for a little outside insight into how good a game is, though I don't rely on it. I mostly look at reviews for details on how much content a game has, how hard it is, etc, that way I can know if it is worth paying full price for a game. I seem to recall enjoying the Pac-Man World game on the Playstation so this might be okay. You know what would be real nice would be including faithful arcade emulations of the original Pac-Man games! I don't believe in a world where PAC-MEN have noses!! I'm not sure I like the whole "eating" mechanic to the game. It seems to prevent you from moving for a second, I'd much rather you eat while moving. This looks slightly mediocre to me. If this will be like the Pac Man World series, I wouldn't mind. In fact, I always wanted a Pac Man World 4. Too many great games I don't have the time and/or money to buy and play. Certainly not wasting money on THIS. Umm... no. Even ignoring that it looks horrible, he can just freely eat ghosts? Since when was that ever a thing? Yikes. I don't know what I'd do with Pac Man but this looks amazingly generic. Ghosts that barf jello and then Pac Man eats the Jello. I try to be positive on new games, but wow. I am surprisingly hyped for this! the munching sound is generic and annoying. if that is tge final sound i won't consider getting this. potentially the model to be used in the new smash bros? This game doesn't look fun to me. Too much wide open space, and the controls look challenging to master, drying to nap running ghosts and all. Also, the whole "teenager band of ultra-powerful misfits saving the world" looks kinda, well, trite. And slightly lame, too. There are subjective, objective, and a mix of both. Many gamers depend on objective reviews to see what games are worth buying since it focuses on the content itself. Subjective reviews are the personal feelings and thoughts about a game and how it. The mix is an intelligent review with flair. Okay, perhaps that wasn't the best way to explain the last one, but you do get what I mean right? There is a difference between liking a game, and if you think it's generally good. The mix obviously mixes those two into the score. The subjective base it on how much they liked it, and objective's scores base it on the actual quality. Of course, people's senses of quality may be different, but it's far different from opinion; it's your thoughts. @yoshisaredragon I'm pretty sure Pac-Man is in high-school in the new show. @HeatBombastic I was just wondering what became of the TV series. I'll probably get the 3DS version. I don't really like Pac-Mans new look. Also this game doesn't look to promising but only time will tell. Why can't they do something like the first Pac-Man World or Pac-Man 2? Love Pac-Man, new look and all, and hoping this game at least turns out decent. Also near the end: "Not-Yoshi" Pac-man? This looks dreadful . . . . .
Aren't the ghosts supposed to turn blue before Pac-Man eats them. @Pixelroy Pac-Man had the long nose since Pac-Land in 1984. No Steam? I guess I'll go with the Wii U version than. This game looks nothing like the amazingness that is Pac-Man World 2. Why must it be a generic looking jump&run? Couldn't they just make Pac Man Vs. or another old school Pac-Man with 100 levels and 5-player mode or something? I heard the Xbox got a good one of the 'original' kind. Man this trailer sure is disappointing... too much cutscenes, too few gameplay scenes. I'd rather play the Pac-Man point&click adventure on SNES. While this doesn't look as good as my old buddy Pac-Man World 2, it still looks descent. The chomping mechanics look a bit off, but at least they're trying to make this game more like Pac-Man World 1 and 2. Still though... from what I've seen, I don't think this game will outdo Pac-Man World 2. Ghostly Adventures does look worth a go, but if this game is any better than World 2, then I'll be really surprised. @aaronsullivan Well I'm not going to lie, I agree with you. Pac-Man used to be my childhood hero during the Pac-Man World era, and then when I look at this game (Ghostly Adventures) and some other recent Pac-Man games (Pac-Man Party, Pac & Galaga Dimensions, etc. ), it's like comparing a mouse to a frog. Pac-Man feels much more bland and generic than he used to be, and I missed the time era when Pac-Man really felt unique. Looks good at least the 3DS one. I don't want to beat a dead horse or anything. But I'm not too sure. Looks pretty dire to me, gameplay seems generic, sound effects are annoying, art style doesn't do much for me. But hey this is only an announcement trailer, it may very well look better in the future. Well, I never played the Pac-Man World series, but I may be inclined to give this a closer look for Wii U. If Pac-Man 2: The New Adventures comes to VC to commemorate this, I'm happy. If not... I have zero interest in this. But hey, kids who watch the TV show might like it, so whatever. As a platformer, it looks decent, but generic. As a Pac-Man game, it looks like a waste of time. is it just me, or is it when pac-man smiles it gives you the creeps? especially with teeth. @LuigiMan200 YouTube is ALL negative comments. I avoid its comment section simply to maintain my sanity. looks like rubbish. i like my pacman world games, but this just looks like trash. So all of a sudden Pacman can eat ghosts without taking a special pill first?! Anyway, the game doesn't look that great! I am a huge Pacman fan and looking forward to this. I am happy for the upcoming show and will enjoy it with my kids. TV show looks awful but game might turn out good. Though I would of preferred a Pac-man world.